Thomas Radford (1793-1881) trained as an apprentice to his uncle, a surgeon attached to the Manchester and Salford Lying-in Institution, a maternity hospital. This first-hand experience with obstetric patients inspired Radford to become one of the nineteenth century’s eminent obstetricians, and gives him a proud place in Manchester’s rich medical history. Before the eighteenth century, the care and treatment of pregnant women in Europe was an almost exclusively female pursuit which rigorously excluded men. The presence of a male doctor at a birth was a rare event, and only occurred when the midwife had exhausted all normal means of managing a complicated delivery. Having men deliver women of their children was seen as offending female modesty, and the medical community was suspicious of men entering the field. However, with the advances of the eighteenth century, such as the introduction of obstetric forceps, and the founding of lying-in hospitals, men entered an area formerly controlled by women. Male obstetricians became an important section of the medical community, and by the late nineteenth century the delivery of infants by doctors had become normalised and popular. Thomas Radford was arguably Manchester’s leading obstetrician in the first half of the eighteenth century. He was effectively in charge of the Manchester and Salford Lying-in Hospital (which became St Mary’s Hospital), and taught obstetrics at the Manchester School of Medicine. In the course of this work, he created a large and unique collection of medical illustrations. This collection has been in the custody of the Library for many years, but it is only recently that we have studied the collection, and realised its significance. Radford 54: Watercolour and pencil illustration of blood vessels. The collection contains over 250 individual images, created in a variety of media, including watercolour, gouache, pencil, ink, and oil paint. The illustrations are mounted variously on board, paper, canvas, or designed as posters; they range from postcard size to over 2 metres in length. Radford may have made some of the images himself, but most are evidently the work of trained illustrators and artists. His commitment to pioneering obstetric techniques is reflected in the images. Radford was one of the first surgeons to advise abdominal section. He was present when Charles Clay performed his first ovariotamy and supported John Hull’s pioneering work on the caesarean section. There are numerous images in the collection of abnormal ovaries which have been removed post-mortem or have possibly been removed via ovariotomy. Similarly there are multiple examples of successful (and non-successful) caesarean sections featured. Aseptic surgery was still evolving during the nineteenth century and the high mortality rate associated with caesarean section meant the technique was rejected by the mainstream medical community. These images were used as a teaching aids by Radford for his lectures in midwifery. In addition to being medically and physiologically significant, the pictures are also distinctly artistic – the fine watercolours show rich, detailed features contrast while some of the developmental diagrams are bold, abstract, almost Miró-like in appearance. Radford 44: Diagram showing embryo development. 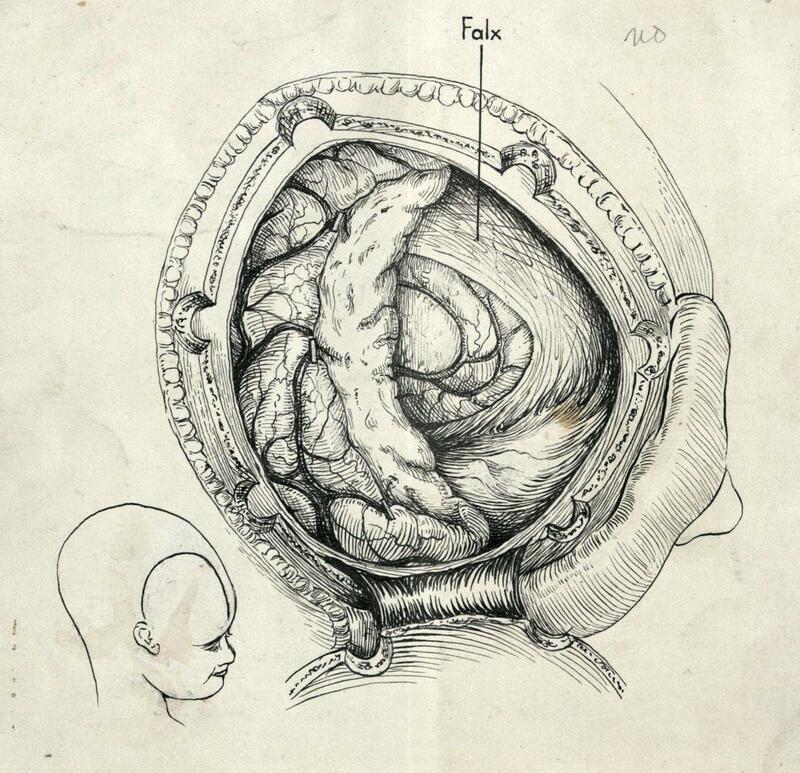 The Radford collection of medical illustrations is a useful, beautiful and captivating collection which is beneficial not solely for the study for the history of obstetric medicine but also the histories of anatomy, medical illustration, art and printing. I joined the Special Collections team in March as part of an exciting new project to catalogue and promote engagement with the Library’s 1801-1949 printed medical collections. Generously funded by a Wellcome Trust grant, the project aims to unlock access to the collections for academics working in medical humanities and those undertaking interdisciplinary research, enrich teaching and learning across a range of disciplines and facilitate public engagement. All access starts with high-quality catalogue records, and I am currently working my way, one book at a time, through a fascinating array of material to put that foundation in place. Some highlights so far are photographed throughout this post. Largely drawn from the library of the Manchester Medical Society, which itself ingested the libraries of Manchester Royal Infirmary and St Mary’s Hospital for Women and Children in the early 20th century, the collection of over 30,000 printed volumes has been designated one of the major UK research collections in the field. Until now, however, access to the vast majority of the collection has been significantly hindered by its omission from online catalogues. This project focuses on a targeted group of subject areas: public health, pathology and clinical medicine. In total, approximately 7000 items! When the Manchester Medical Society was founded in 1834, the provision of a medical library and reading rooms for its members was deemed a “necessity” for “members of the Profession residing in the North of England”. From the devastating effects of first epidemic of cholera on British soil 1831 to the founding of the National Health Service in 1948, the Society’s medical collections lay at the heart of its professional activity and reflected new developments in both medical practice and professional organisation regionally and nationally. Under the direction of leading Manchester ophthalmologist and avid bibliophile Thomas Windsor (Honorary Librarian, 1853-63 and 1879-1883), the library quickly acquired the status of the most valuable collection of medical books outside London. The number of volumes and pamphlets rose from 2558 in 1858, to 12594 in 1863, and greatly expanded in areas of particular interest to Windsor – rare early-printed medical texts and foreign, especially continental and American, publications. Rich pre-1801 holdings are now housed at the John Rylands Library. It is both surreal and immensely satisfying to contribute to the current life of the collection, knowing its history as a cutting-edge resource for the burgeoning Manchester medical profession in the 19th and early 20th centuries and the rich network of local practitioners that informed, and in turn were informed by, its development. It has huge potential to prove as valuable to current researchers, students and those interested in the scientific heritage of Manchester, as it was to those physicians responding to the challenges of modern healthcare in their time. The collections are open to anyone with a research interest by appointment. Please see this guide to consulting special collections at the Main Library. All books that have been catalogued online are searchable via LibrarySearch. The recent acquisition of John Peter Smith’s papers on the foundation of the cervical cytology unit in Manchester has triggered interest into the origins of cervical smear testing in the UK. Sir John Williams first identified the lesion that would eventually be known as carcinoma in situ of the cervix in 1886; however, cancer has been described since Egyptian times, and both Hippocrates and Galen recorded it in their patients, and Paul of Aegina (c. 600AD) diagnosed and treated the disease cancers of the uterus. However, it would not be until the development of microscopes and histology that diagnosing and effectively treating cancers could be achieved. The pathologist Walter Schiller was the first to propose the term “pre-invasive carcinoma”, but it would be George N. Papanicolaou’s contributions which would have a profound impact on cervical cancer diagnosis. Papanicolaou discovered, courtesy of a willing (female) hospital volunteer, that individual cells from the cervix have morphological features which may be used to diagnose carcinoma. In 1938 Papanicoloau and gynaecologist Herbert Traut worked on a study which concluded that many asymptomatic cancer cases could be detected by smear at an earlier stage than was detectable by biopsy. The pair were critical of the biopsy method, which they argued was time-consuming and expensive, and thus didn’t have large scale feasibility. This meant that treatment for uterine cancer was limited to well developed or late-stage cancers. This discovery led to preventative screening gaining traction throughout the 1940s and 1950s, and local trials were set up in North America, including one in British Columbia set up by David Boyes and Fidler as a project to determine whether screening with Pap. smears could reduce the incidence and mortality from invasive cervical carcinoma. 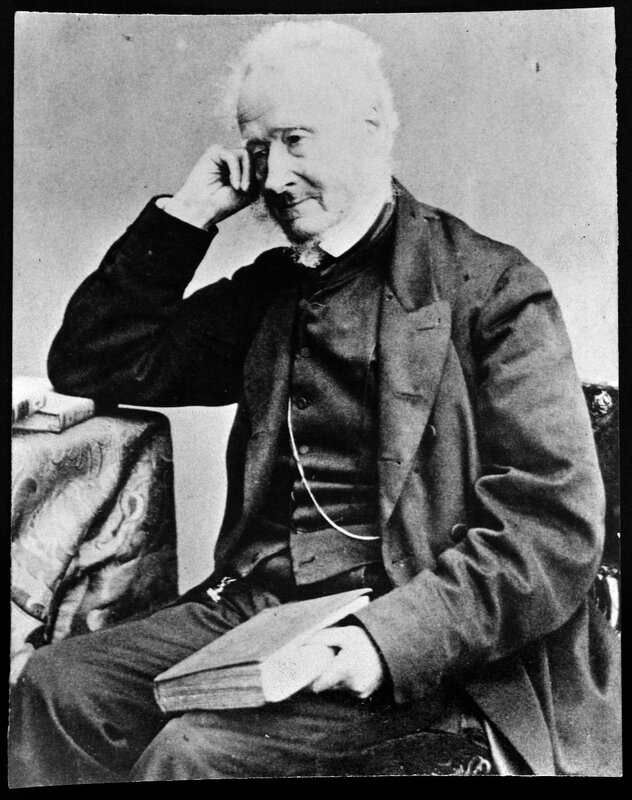 Photograph of John Peter Smith, provided by his family. It was likely that this project inspired John Peter Smith in 1962. Smith was born on 11 July 1922 and was educated at the University of Manchester. He had a successful career as a pathologist before returning to Manchester in 1954 as a lecturer in pathology. Smith had been made consultant pathologist at the Christie Hospital in 1960 and was now contemplating conducting his own similar cervical screening project in Manchester. In a research grant application (submitted in 1962) [JPS/1/2/1] which would help establish a cytodiagnostic unit at the Christie Hospital, Smith makes reference to Vancouver and British Columbian studies (likely Boyes and Fidler’s project), reiterating the success rate of reducing the incidence of invasive cervix cancer. The archival material covers the appointment of Muskett, a graduate cytologist, who was transferred from the Christie’s associated research laboratories to work directly with the pilot scheme. There is also discussion about the best method for performing the cervical test; they weighed up the merits of the “Davis pipette technique”, the Papanicolaou test, and Ayre’s smear. Both the Papanicolaou and Davis tests were praised for their simplicity; being able to be performed without special instrumentation or patient preparation. However, a paper submitted to the Lancet which reflected on the project shows that the project opted for the Ayres method on the grounds that it provided the most complete spectrum of cells for analysis, and the “visualisation of the cervix by a trained person… may assist the interpretation of the smear.” Recognising that the Ayre technique was more complicated and required more training, a demonstration film showing the methods of fixing, preparation and packing was made at the Christie and St Mary’s Hospital in Manchester. The project also developed a new way of transporting the smears from the GP to the cytodiagnostic laboratory, by preparing a fixative with dissolved wax which allowed the samples to be transported by post. Photograph presumed to be of the Christie Hospital, labelled ‘Here Beginneth Cytology’ c.1963. Ref. JPS/3/1. In the 50+ years since Smith set about establishing his pilot study the [face] of cervical screening has changed. Before 1963 cervical screening was conducted by pathologists and GPs with concerns about individual patients, but by the mid-1990s the NHS screening program had become embedded into routine public health practice, and regular cervical cancer screening combined with a national program of HPV vaccination is now seen as standard for women aged 25-64. Scholars have described the introduction of cervical screening in 1964 as haphazard; at the time programmes were established on the back of individual cytologists, gynaecologists and pathologists. The early twentieth century saw progress towards identifying the early stages of cervical cancer, which precipitated a move towards not only prediction of the likelihood of cancer but also preventative methods. Smith’s project furthered cervical screening as a practice centred on preventative medicine, instead of a procedure performed purely as a diagnostic tool, and consequently Manchester can regard itself as one of the foundations of cervical smears . Readers can consult Smith’s archive on the University of Manchester Special Collections catalogue: https://archiveshub.jisc.ac.uk/manchesteruniversity/data/gb133-jps. Patricia A Shaw MD FRCPC, ‘The History of Cervical Screening I: The Pap. Test’, Journal of the Society of Obstetricians and Gynaecologists of Canada (2000), 22(2), pp. 110-14. J P Smith, S M Muskett, E C Easson, ‘Evolution of a Community-Screening Project’, The Lancet (July 1965), pp. 74-5. George N Papanicolaou MD PhD, Herbert F Traut MD, ‘Diagnosis of Uterine Cancer by the Vaginal Smear’ (1943), in Dona Schneider and David E Lilienfeld (eds), Public Health: The Development of a Discipline, Twentieth Century Challenges (New Brunswick: Rutgers University Press, 2011). Dona Schneider and David E Lilienfeld (eds), Public Health: The Development of a Discipline, Twentieth Century Challenges (New Brunswick: Rutgers Press, 2011). The patient case files of neurosurgeon Sir Geoffrey Jefferson (JCN) are rich in visual materials which enriches the textual information given in the notes. The visual material comes in the form of clinical, operative, and pathological photographs, x-rays and positive copies of x-rays, and medical illustrations (which have been mentioned in a previous blog post). They help to give a multifaceted view of the patient giving as much information as possible to the practitioner over the course of a patient’s treatment. This is particularly true of x-rays in which a further insight not visible to the naked eye is made possible. As well as assisting in diagnostics and treatment such images were and are integral to engaging medical students, and Jefferson comments on certain cases how he has used them time and time again to teach his students. Additionally they support academic research and we can see how the material in these files would have supported Jefferson’s own research interests. The study of pituitary tumours was one of Jefferson’s interests on which he published a number of papers and there are a great number of these cases within the collection. A common symptom of some pituitary tumours is acromegaly (the increased production of growth hormone) which Jefferson documents in his patients by photographing their hands to demonstrate the increase in size. Medical photography also exists as a useful tool in documenting unusual or rare cases, and there a number of images of young children suffering from spina bifida and large meningocele. The importance of recording the progress of certain cases can often go beyond the life of the patient to include post mortem images and pathological specimens which often reveal things not evident when the patient was alive. All in all the visual material in the collection and associated collections (VFA.7 – Medical Illustrations of Dorothy Davison) add much greater depth to a patient’s medical history as well as raising questions of how the patient was viewed and the ethical concerns surrounding the creation of such exposing images, the way the patients were posed, and consideration of the impact it would have had on them. VFA.7.203 – ink drawing at operation after the right frontal lobe has been removed, n.d. 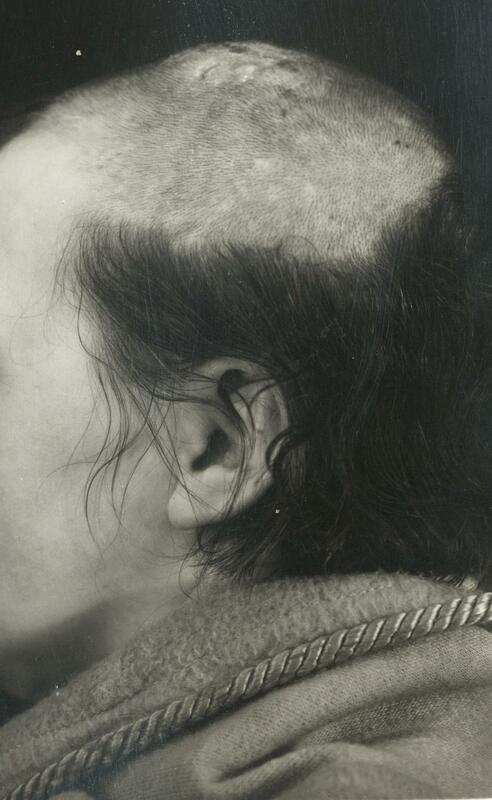 Within the collection of Jefferson’s Patient Files (JCN) there are at least twenty examples of the procedure being performed between the years 1932 and 1939 along with examples of temporal, occipital, and cerebellar lobectomies. Of these twenty examples, twelve are known for certain to have died. 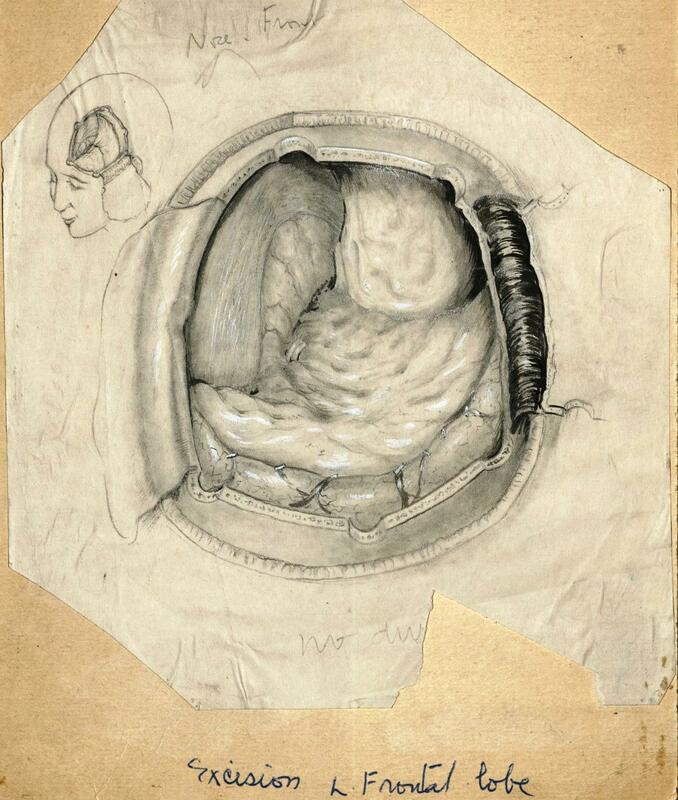 A number of these patient files link directly to descriptions he gives in published works as well as to items of medical art produced by the artist Dorothy Davison. However, the existence of a number of patient files which contain descriptions of the procedure that are not referenced in his published works give a greater insight into the overall success and efficacy of the procedure. Patient 1935/82 is one patient for whom we hold their patient file and a medical illustration and who also features in Jefferson’s 1937 article. A 44 year-old male clerk from Withington, he was operated on in April 1935 with uncertain results. Although stable after his 5 ¼ hour surgery, showing no signs of memory loss, and able to hold a conversation he did however display other signs of agitation including a tremor in the hands and feet, continuation of his seizures (although less often), and coldness in his feet. He died not long after the procedure was performed from uncertain causes preventing the further monitoring of his condition. There are a handful of incidents of syphilis, more specifically neurosyphilis, amongst Geoffrey Jefferson’s neurosurgery patient files. Given the prevalence of syphilis during the first half of the 20th century prior to the widespread introduction of penicillin in the 1940s this is hardly surprising. The onset of neurological symptoms can come at any point in the course of infection and can easily be mistaken for a number of other neurological manifestations, hence why these cases were referred to Jefferson. The diagnosis of syphilis was usually unknown when these patients were first sent to Jefferson, but knowing how common neurological symptoms as a result of syphilis were the majority of Jefferson’s patients were tested for the infection soon after their admission. Once it had been determined that they were not suffering from any form of brain tumour and so would not benefit from surgical treatment these patients would be transferred over to the medical wards where mercury was still employed as a treatment. The detrimental effects of syphilis can be seen in many different types of medical archives, most notably 19th/20th century asylum records where patients were admitted suffering from ‘general paralysis’. Further reading of some of Jefferson’s cases can reveal the general symptoms associated with neurosyphilis, the very varied demographics of its sufferers, and in some cases the attitudes to such a diagnosis. Patient 1931/96 was an 11 year old boy admitted to the Manchester Royal Infirmary (MRI) on 24 August 1931 presenting with recurrent watering from his eyes, sudden development of almost complete blindness, discharge from the ears, and headaches over his eyes. 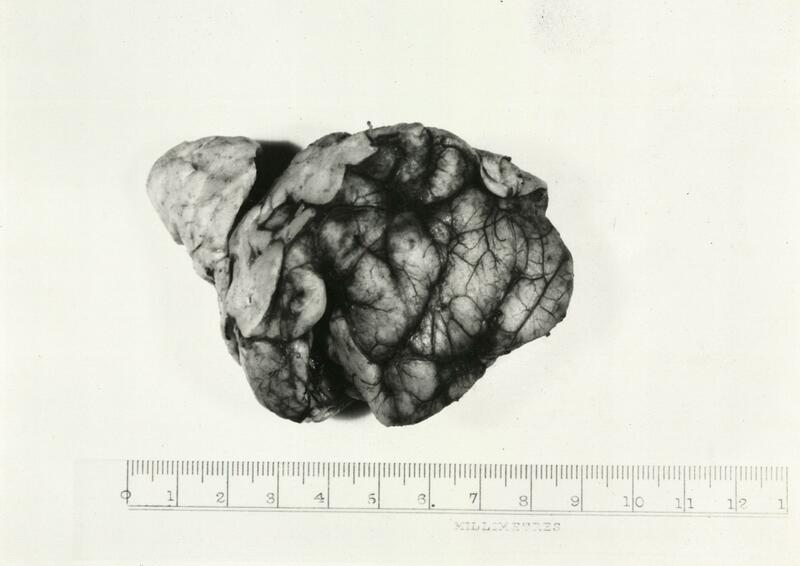 Originally a cerebellar tumour was suspected but x-rays showed no evidence of this and the Wassermann reaction (a test for syphilis) came back strongly positive. Once it was established there was nothing that could be done for the boy surgically he was transferred over to the medical wards with a diagnosis of syphilis of the central nervous system. The patient was then discharged and treated for his condition at home. Patient 1934/238, was a 45 year old female shopkeeper admitted to the MRI in 1934. She did not present with the same psychological or neurological symptoms as some of the other patients but rather had developed large abscesses of the head and shoulder. A diagnosis of chronic syphilitic osteomyelitis (bone infection) of the skull was arrived and with consultation from the orthopaedic surgeon Sir Harry Platt her abscesses were aspirated. The Jefferson case files are a fantastic source not only for the study of the manifestation of disease and the development of different treatments but also the various attitudes expressed by both medical staff and patients surrounding such issues as sexually transmitted diseases, fear of hospital treatment, and attitudes to women. 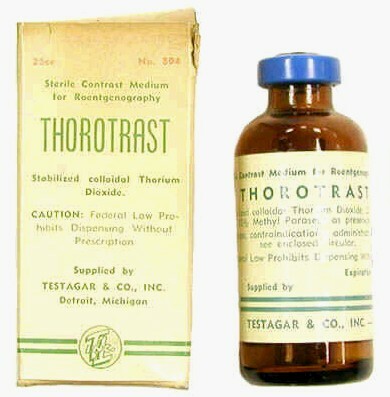 Thorotrast was a radiographic contrast agent first introduced in the late 1920s which contained the radioactive compound thorium dioxide. Originally used in angiography (the process of imaging blood vessels) neurosurgeon Geoffrey Jefferson and his team began using it in 1935 for ventriculography (a process for imaging the brain). Jefferson’s patient case files for this period are housed at the University of Manchester Library and demonstrate the development and use of this technique. Two of Jefferson’s close colleagues, the radiologist Edward Twining and the neurosurgeon George Rowbotham, published an article in The Lancet illustrating how the injection of Thorotrast into the cerebral ventricles would work in comparison to the already existing method of injecting air during the process of ventriculography. It had been noted that injections of air often contributed to the instability of the patient’s condition and there could be noticeable immediate after effects, such as headaches, whereas patients receiving Thorotrast instead were much more stable in the short term. Radiographically the result was much improved too with increased clarity and definition. The case discussed in Twining & Rowbotham’s article corresponds with patient 1935/99 in Jefferson’s case files, which contains much more detail about the patient’s medical history and resultant condition. It is believed that this patient is the first of Jefferson’s patients on which this new technique was tried out and Jefferson himself notes in this particular file that he believes it will change the whole outlook of ventriculography. The safety of Thorotrast was soon brought into question and has since been described as the “most potent human leukemogen yet identified” (Aronson, 2006). Once administered it eventually settles in the reticulo-endothelial system, particularly the spleen and the liver, which was already known at the time of use in the 1930s but the resultant long-term effects had yet to be anticipated. At proceedings of the British Medical Association’s annual meeting in 1933, throium was referred to as a “feebly radioactive substance” yet the long biological half-life of Thorotrast meant that patients would be exposed to internal radiation for the rest of their lives. Follow up studies into patients in more recent years have shown very high incidents of liver cancers and leukaemias in particular. These effects were also investigated in Manchester and there is evidence in Jefferson’s case files of patients being followed up in the 1950s in an effort to determine the effects Thorotrast may have had. The details in Jefferson’s patient files stand as a fantastic source for the development of radiographic imaging techniques, their long term effects, and the ethical considerations surrounding the use of new and as yet not fully understood techniques. During the current cataloguing process all patient files where there is definite evidence of Thorotrast having been used will be clearly marked for easy identification. Thomas Radford spent his working life in Manchester and dedicated much of his time to St Mary’s Hospital for Women and Children and to the teaching of midwifery. He taught at the schools of two of the city’s pioneers of medical education, Joseph Jordan and Thomas Turner, as well as privately from his own practice. Over the years he collected an extensive library and numerous medical specimens, mostly related to the field of midwifery and obstetrics, which he later donated to St Mary’s Hospital. The Radford Library was donated to the University in the early 20th century and many of Radford’s manuscripts, both his own and those he collected, form part of the Manchester Medical Manuscripts Collection which was catalogued earlier this year. The University also owns a number of illustrations that formed part of Radford’s collections and will be catalogued in the coming year as part of a Wellcome Trust funded project. The drawings are nearly all obstetrical and vary in their detail. It is clear that a number of them have been produced to assist teaching and illustrate key points whilst others may have been bought by Radford to add to his extensive collections. Whilst much of the material that forms part of the Manchester Medical Manuscripts Collection has a great deal to offer in terms of the study of early medical teaching in Manchester some of Radford’s manuscripts offer a slightly different perspective. Most of the other lecture notes in the collection were written either by students or professional copyists whereas the surviving notes from Radford’s midwifery lectures are written in his hand with details of the cases he intended to use to illustrate specific points. Combined with the surviving medical illustrations that filled his museum and served as teaching aids, we get a rare insight into early 19th-century medical education in Manchester from the perspective of the teacher. Working through the many patient case files of leading neurosurgeon Geoffrey Jefferson there are a number of particularly significant topics and themes that stand out as being of interest, which I will explore in various blog posts over the coming months beginning this week with the development of radiotherapy and brachytherapy as a therapeutic treatment in Manchester. Wilhelm Rӧntgen discovered the effect of x-rays in November 1895 and the field of radiography developed very rapidly from this point onwards with investigations into the therapeutic uses of radiation beginning almost immediately. Efforts to treat cancer patients with radiotherapy and radium were experimented with in Manchester very early on, although somewhat tentatively at first, with the Manchester Radium Institute being founded in 1915 within the confines of the Manchester Royal Infirmary. 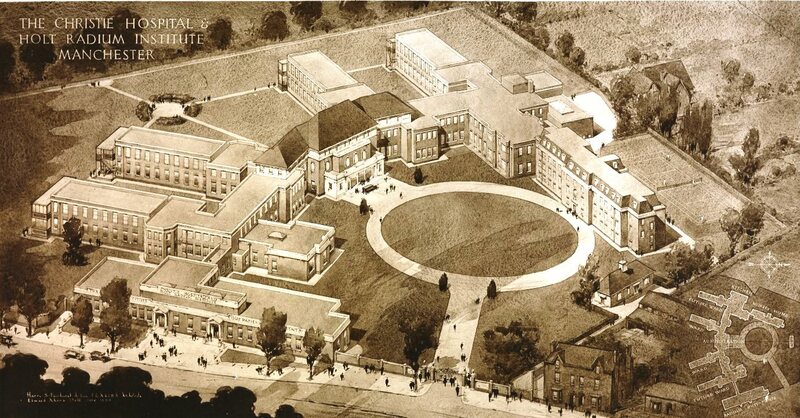 By 1933 the Christie Hospital and the Holt Radium Institute had moved to share new buildings on the outskirts of Manchester. In 1931 James Ralston Kennedy Paterson (1897-1981) had been appointed radium director of both the Holt Radium Institute and the Christie Hospital and was seen to be the driving force behind the uniting of the two facilities and the creation of a centralised and standardised radiotherapy service in Manchester. In the treatment of his patients Jefferson made liberal use of both radiotherapy and brachytherapy, as either complementary to surgical treatment or as an alternative, and in turn made numerous referrals to Paterson at the Radium Institute. A handful of his early cases demonstrate this, and undoubtedly a greater number and variety of cases will emerge as work to catalogue the later files progresses. Various methods were employed, with gold radon seeds implanted in some patients and casts formed to allow the radium to be placed externally at the site of a lesion in others. The economics of treatment come through in discussions of treatment, where initial wishes to apply radium to the whole vault of patient 1931/98’s head was deemed to be far too expensive and a more localised approach taken instead. More interestingly when discussing the possibility of using radiation to reduce salivary secretion in patient 89/1932 Paterson reveals he has tried this therapy experimentally on himself. The University Library also holds administrative records and reports from the Christie Hospital and Holt Radium Institute including numerous reports compiled by Paterson and his colleagues. Together with the illustrative case studies found amongst Jefferson’s patient files there exists a considerable resource for the study of the evolution of a modern radiotherapy department in Manchester, the development of treatments in practice, their efficacy, and patient experiences. With the culmination of a year-long cataloguing project to tackle some of the Library’s science and medical collections a number of new catalogues are now available online and the material itself available to view in the searchroom at the University’s Main Library. The Manchester Medical Manuscripts Collections is comprised of 317 individual items ranging from approximately the 16th century to the 20th century, although the majority of the material dates from the mid-18th to the mid-19th century. Most of the manuscripts have their origins in Manchester’s 19th-century medical libraries, having been donated to them by some of the city’s most prominent medical men of the time. It is around these men that the collection has been organised, thus illustrating who was responsible for either creating or collecting these manuscripts before they were donated to a larger library. In this way we can analyse the development of Manchester’s medical profession through their collecting habits and manuscripts produced as a result of their professional work. Of particular note are some of the only known surviving copies of lectures given in Manchester’s early medical schools, including those by the likes of Thomas Turner, Joseph Jordan, and Samuel Bardsley. There is also a heavy emphasis on midwifery with over 25% of the material being directly related to the subject. All the relevant subjects comprising medical education at this time are however covered including anatomy, surgery, chemistry, botany, the materia medica, physiology, and the practice of physic. The catalogue is available via MMM. 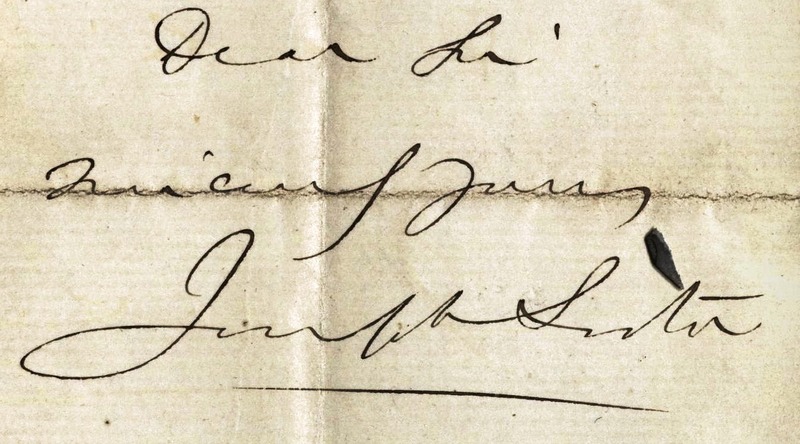 During the course of the cataloguing of the Medical Manuscripts a single letter written by the famous 18th-century surgeon John Hunter that did not belong to the rest of the collection came to light. The letter has been described separately with its own catalogue entry. In the letter Hunter writes to a Hampshire-based surgeon offering him advice on the treatment of a female patient with breast cancer without resorting to surgery. A full description is available via JHU. Wilkinson was a renowned 20th-century haematologist and spent his entire career in Manchester. He is most noted for his extensive research into the treatment of pernicious anaemia and the treatment of leukaemia with early chemotherapy drugs. His papers also represent much of the other important work he undertook, for example his extensive work during World War Two into the health of those working in poison gas factories and his work during the 1960s and 1970s for the University of Manchester’s radiology protection committee. The catalogue is available via JFW. Crace-Calvert is a little known 19th-century Manchester based industrial chemist who dedicated a lot of time to the application of chemistry to public health. This is only a small collection of 13 letters but is most notable for the presence of three letters written to Crace-Calvert by Joseph Lister of antiseptic surgery fame. In these letters he discusses developments in his work and his recent attempts to produce an effective antiseptic dressing. Crace-Calvert was the first to successfully devise a method for the efficient industrial scale production of carbolic acid (phenol), a substance that was at the core of Lister’s research. Other letters in the collection demonstrate Crace-Calvert’s wider involvement in matters of public health with correspondence from the sanitation officer Robert Rawlinson and representatives of both the Admiralty and Central Government Offices illustrating his attempts to see antiseptic practices more widely employed. The catalogue is available via FCC. Finally, time at the end of the project has also allowed for the cataloguing of the obstetrics and gynaecology lectures of Professor Daniel Dougal. Dougal taught at Manchester University and was appointed to the Professorship there in 1926. He produced full and detailed copies of the lectures to assist his students and these served as text books. The content was regularly revised to keep in line with current practices and six separate editions were produced in total spanning 1929-1938. Copies of all six editions, with the exception of the second, survive in this collection and show the development of Dougal’s lectures, several having been annotated by the students who used them. The catalogue is available via DDL. 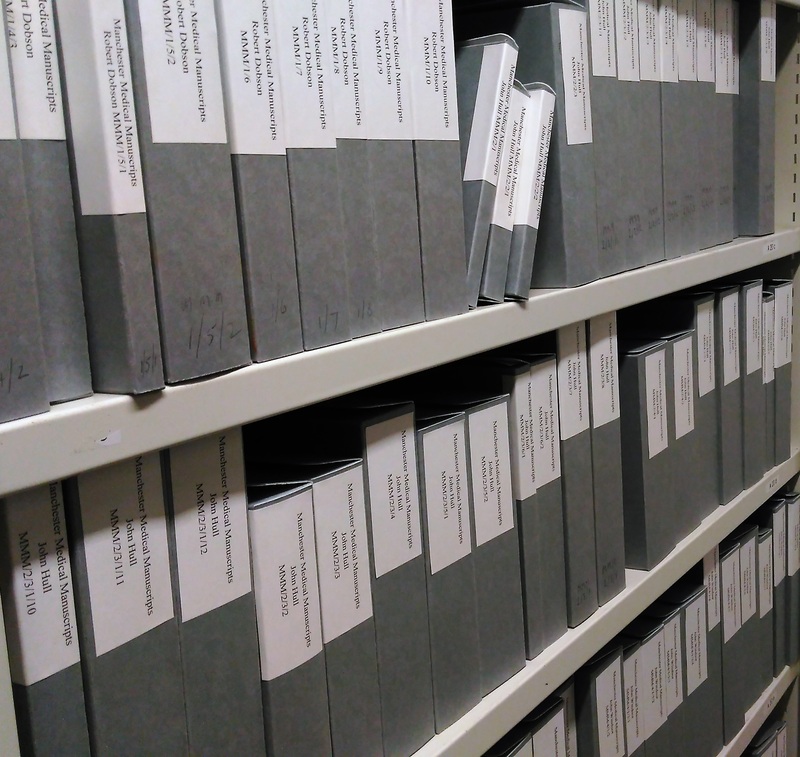 Archives Hub: union catalogue of archives in UK universities etc. Li Yuan-chia - The Man behind the Artist.